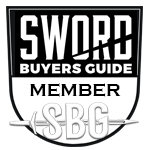 You may remember I picked up a DSA HEMA Viking sword awhile back which I was planning to build a Suontaka sword but couldn't find the fittings. So I now decided to do a Vendel pre Viking sword instead. I'm making the grip out of oak but what I need is a brass grip spacer ring preferably with some design on it. Any ideas ? Look at doing some stamping. I made some metal stamps (little circles and triangles) and did stamps on hand made Thor hammers and some nordic armor embellishments. So if you have a thick piece of brass, stamping would be easy. But weight might be a factor. Yeah I thought about making it myself and might still. Checked locally and couldn't find any place selling thick brass only sheets. Also thought of using a small wide gold or brass ring and filling the gap between the ring and tang with some kind of hard epoxy filler. Just figured buying a premade one would be quicker and look better. Yeah I checked them out but they only have two and they're very plain and in brass they want $58 plus shipping. I was looking for something with a dragon and knot design or just knot design on it.